On the 29th, Satoshi had to work. Since his choices for lunch on Sundays are usually slim, I figured that this particular Sunday would be even harder to find something for lunch since most businesses were going on New Years holidays. 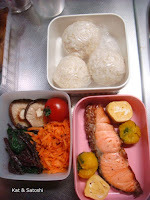 So, I asked him if he wanted a bento (boxed meal), he thought about it and said yes. Salmon, tamagoyaki (rolled omelette), kabocha chakinshibori (mashed pumpkin with parmesan cheese), shiitake sauteed with butter and tonkatsu sauce, spinach goma-ae, ninjinshirishiri, musubi filled with different items (goma takana, ume, konbu). It's the last day of 2013...it was a short, yet long year. Lots of sad days, for sure. But, I am thankful for the time spent with my Mom. And even if most days were stressful, I'm still thankful for the time spent with my Dad. and for friends (real & virtual). 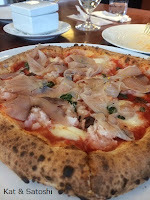 This year, I reconnected with many eating places and old friends. I was lucky to meet up with some blog friends and Flickr friends, IRL (in real life), too. So even if most days were sad ones, there were still good ones and many delicious ones too. 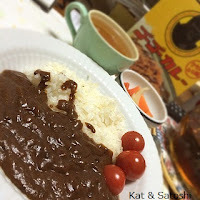 Thank you for reading our blog, I hope 2014 will be a happier and even more delicious year for you. 1. Michael Booth "Doing Without Delia"
2. Joanne Harris "Jigs & Reels"
3. Vivian Swift "Le Road Trip"
4. Jeffery Brown "Darth Vader and Son"
5. Jeffery Brown "Vader's Little Princess"
6. Christina Henry De Tessan "Forever Paris"
7. 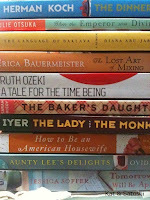 Molly O'Neill "American Food Writing"
8. Peter Mayle "Encore Provence"
Please share with me what you read this year. Re-creating this salad was fun and delicious. It was my first time making these and even though it took some time, I'm glad I tried making these. I had been wanting to try making Japanse cole slaw with purple cabbage and I'm glad I did. This version is much more colorful and tasty too. 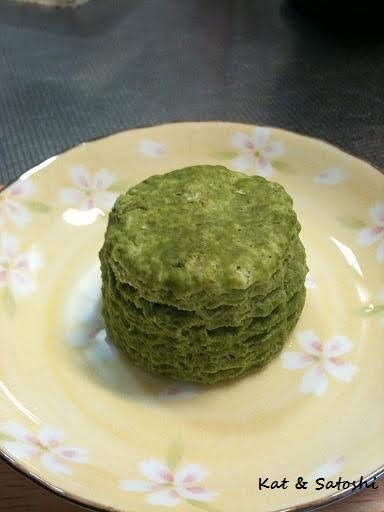 With all the scones I have posted on the blog, these were the first matcha(green tea) ones. 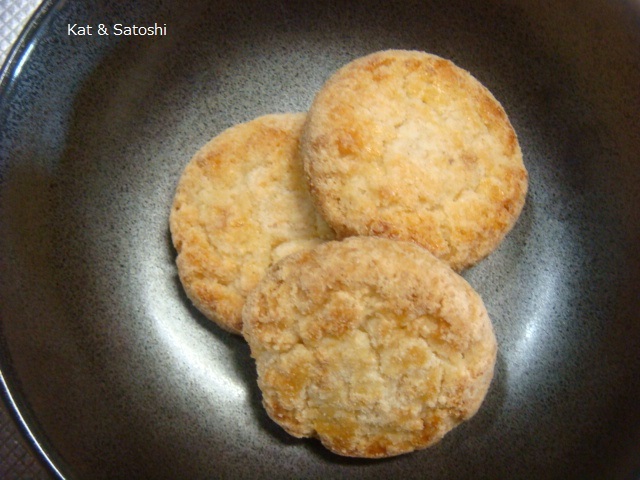 Adapted from a book that Dennis introduced me to, changing the recipe to fit what we had in our pantry didn't change the deliciousness of them. 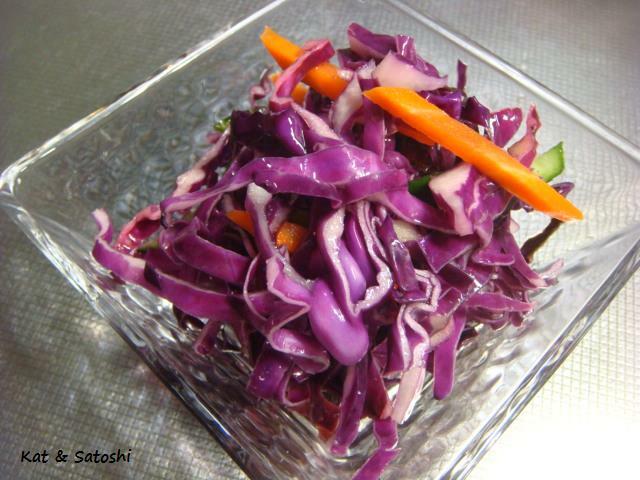 This dish was simple and fast, and it got a thumbs up from Satoshi. 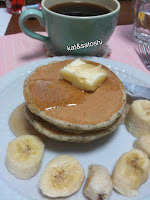 These were delicious, but they didn't freeze too well. 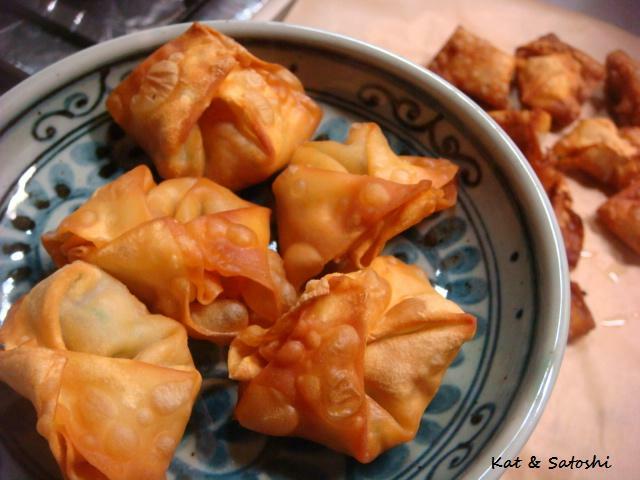 I think if you freeze them they should be done before you fry them. 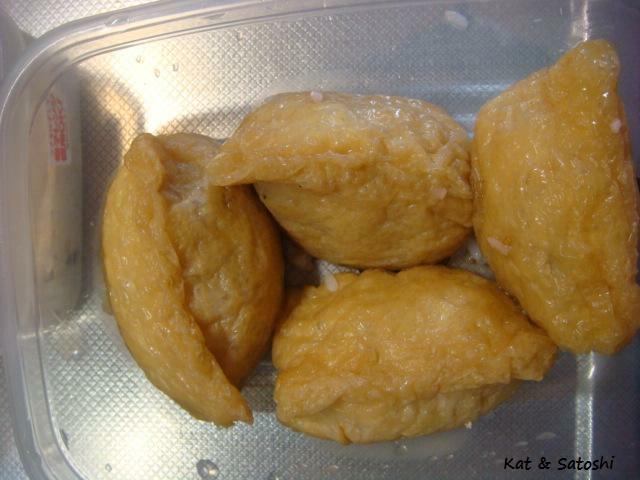 After frying them and then freezing them, they were really greasy...eep! 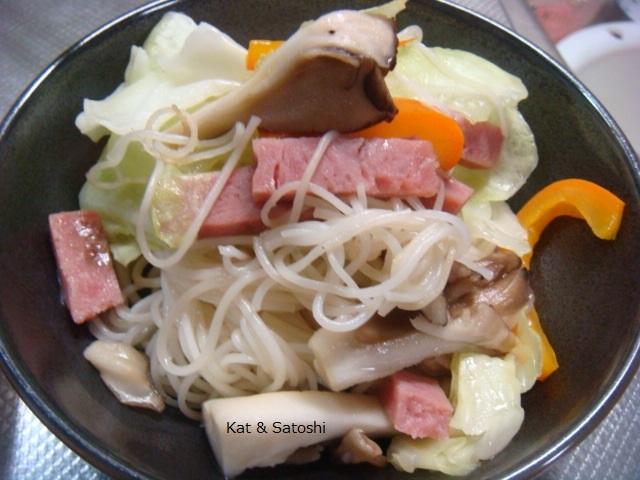 A great way to use up somen in your pantry. 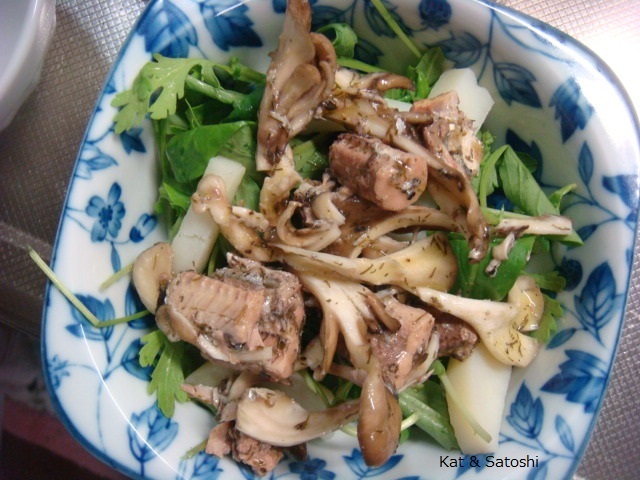 Re-creating this salad was tasty and the marinated sanma and mushrooms make great pupus (appetizers). 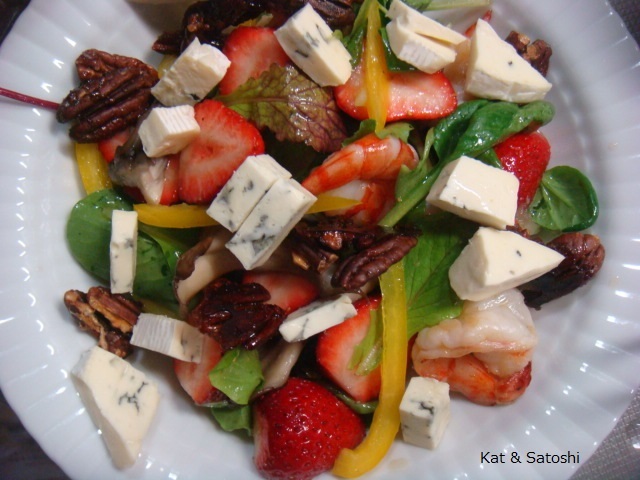 A perfect combination of sweet and sour, this salad is great whenever strawberries are in season. Did you have a favorite from this past year that wasn't posted? Tell me about it in the comments. 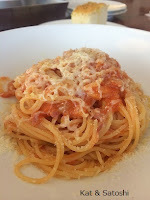 We went back to Echi Ponte Vecchio for lunch last Sunday. 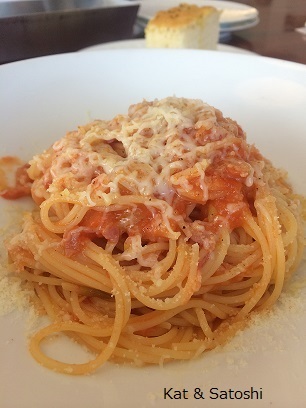 I tried their pasta. This was a roasted leeks, pancetta and tomato pasta topped with provolone cheese. Loved the smokiness from the leeks. Satoshi went with their buri (amberjack) pizza. I didn't try this but it also had some grated yuzu (citron) zest over the fish. Their food is always tasty, I'm sure we'll be back. 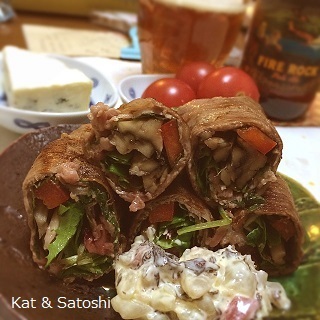 For our Christmas dinner I made Rolled Beef with Japanese Tartar Sauce. Besides the shiso (perilla) leaf, I used baby leaf, a slice of red bell pepper, as well as some maitake in each roll. This cooked up really quickly because the beef was paper thin. We also had some cherry tomatoes, some bleu cheese and some beer. 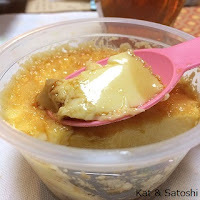 Dessert was a rich custard pudding by Tada Farms, from the Tohoku area. Nothing too fancy nor time consuming, my kind of cooking. 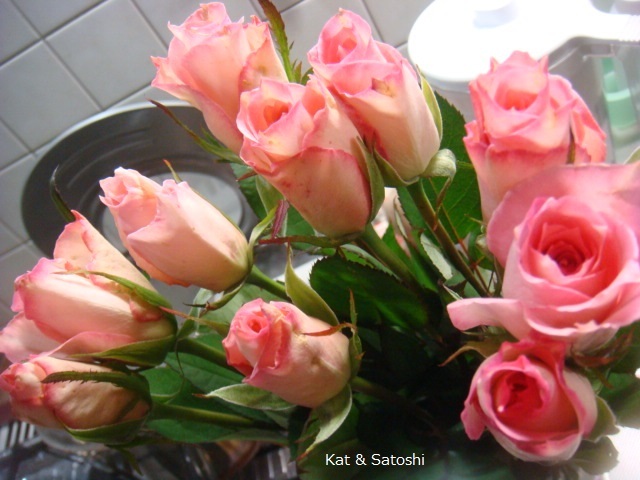 It's Friday here, Satoshi is off for the next week. We'll be doing O-soji and maybe getting out and about if the weather is cooperative. I found these at an import market. 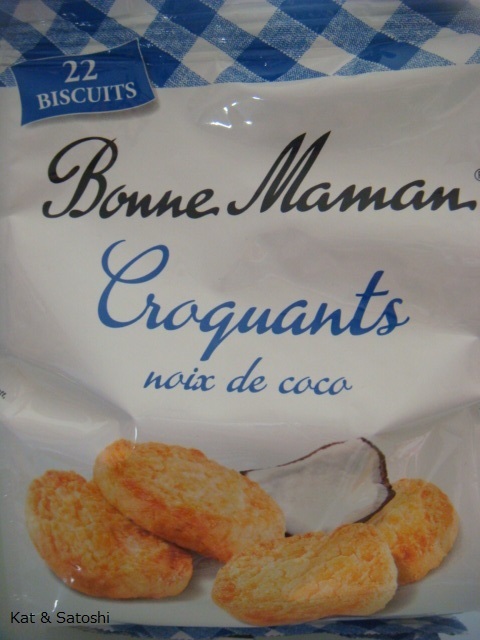 What I love is how much coconut they use in these. They not only use grated coconut but coconut oil as well. When you open the package the aroma fills the air. Nice with black coffee or café au lait. Unfortunately, Christmas isn't a holiday here, so Satoshi had to go to work. 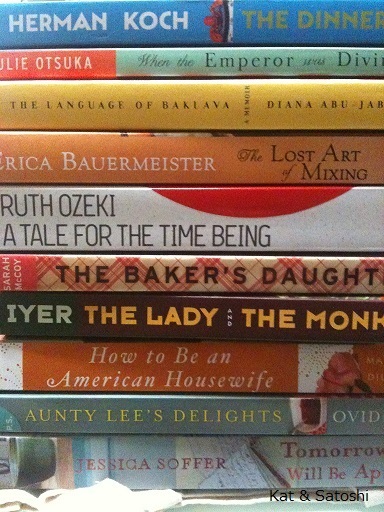 Just wanted to share with you what Santa brought...books! 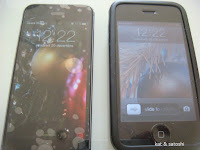 and an iPhone5S (on the left)...Thank you! And from Satoshi, these pretty roses! I know most of you will be having Christmas tomorrow, so I hope Santa brings everything you wish for! 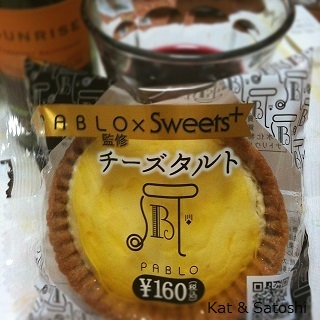 Pablo, a popular cheesecake shop in Osaka, teamed up with Family Mart's +Sweets brand and is now selling these tiny cheesecake tarts at Family Mart. The crust was a little burnt, and there is a sweet gelee that tops this cheesecake. I don't think I would buy this one again, but it was nice to try. 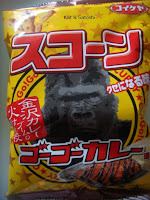 This corn snack flavored with Go-Go Curry. I've never tried the curry from Go-Go Curry, but now know that they have a shop in Kyoto, so the next time I'm there, I hope to try them. The chips starts out a little sweet and then the spices and heat kick in. 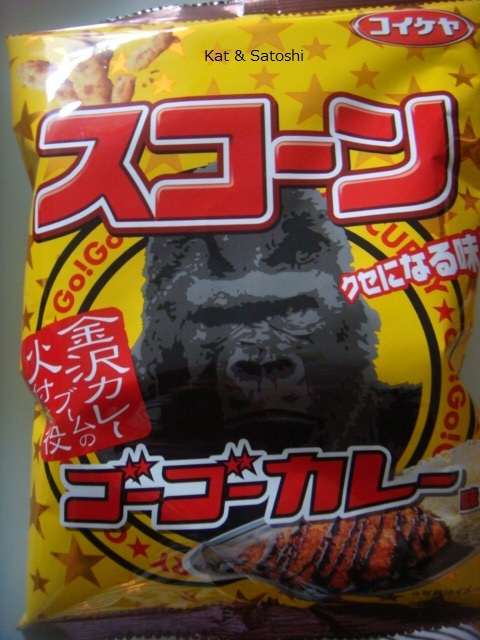 I also found an instant curry by Go-Go. This like the chips starts out a little sweet and then the spices and heat kick in. A nice thing about this instant curry was that there were two pouches in the box. Usually when you buy instant curry there is only one pouch. Another snack I am liking is Ottoto (oh-tote-toe). This is a potato snack that is baked. Recently they came out with a Rilakuma version. Rilakuma is a popular character. It was fun trying to find the Rilakuma shapes amongst the sea creature shapes. 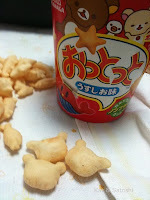 There is another version where you look for the Rilakuma shapes amongst the zoo animal shapes. 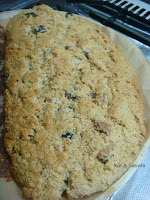 Had to "wing-it" for this year's Stollen. I didn't have Rum to soak the fruits and nuts in. 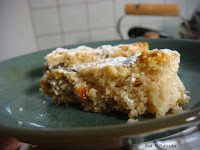 I was going to use Grand Marnier, like I did before, but didn't have enough, so I soaked it in Amaretto instead. Also, I only used orange peel and dried cherries. For the nuts, I used almonds and walnuts. I shared most of this with Satoshi's German class. I am wondering what to do with the alcohol that I soaked the fruits in. Some of my twitter friends gave me some suggestions, but if you have some, just write them here. 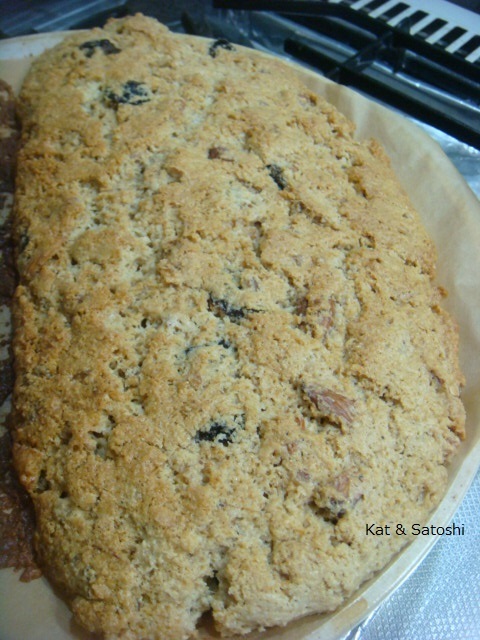 I hope Satoshi's classmates enjoy the Stollen. p.s. today is a National Holiday, Happy Birthday to the Emperor of Japan! So, there was Ispahan, then recently there was Satine. A blend of orange, passion fruit and mango...so tropical. 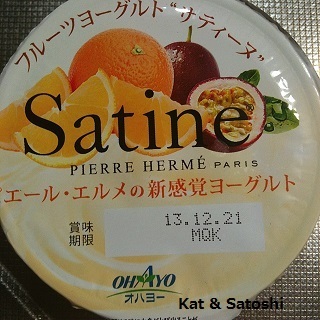 I'm glad Satoshi and I got to try this yogurt too. I recently stumbled upon the savory line from Biscot Tea. Rosemary & Red Chili--spicy and delicious! 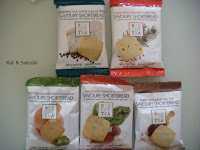 I'm glad I tried these and would definitely buy the roasted onion one and rosemary one again. I know, I know by looking at the title you're shivering if you are reading this in wintry climates, but strawberries are kinda in season over here (for Christmas), so it was the perfect chance for me to try this. 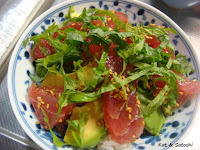 While in Hawaii this past summer, I scribbled down this recipe by Zippy's, a popular local family style restaurant. NOTES: This was delicious! I think the bleu cheese I used needed to be a little stronger, but all the other flavors went nicely. The dressing is a bit puckery, sweet-sour. 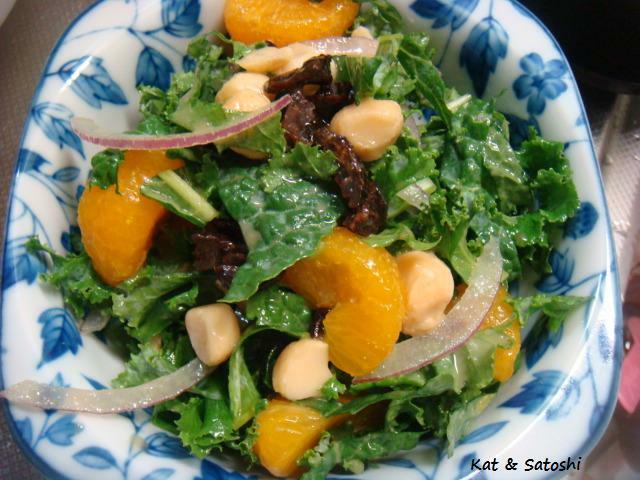 I think the next time I make this dressing, I'll add a little dijon or whole grain mustard. 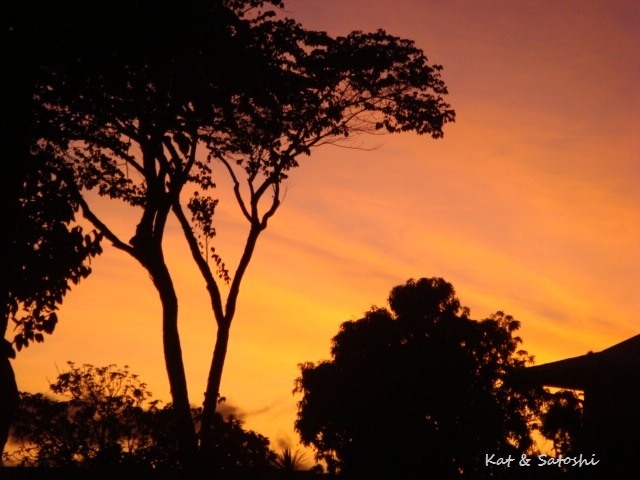 It's Friday here, I hope you enjoy the weekend! 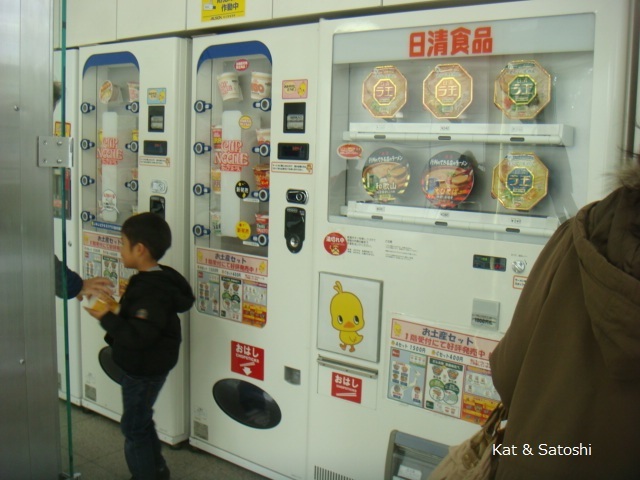 Monday, I met D and his friend at the Instant Ramen Museum in Ikeda. It had been about 10 years since I last went and they renovated the place since then. 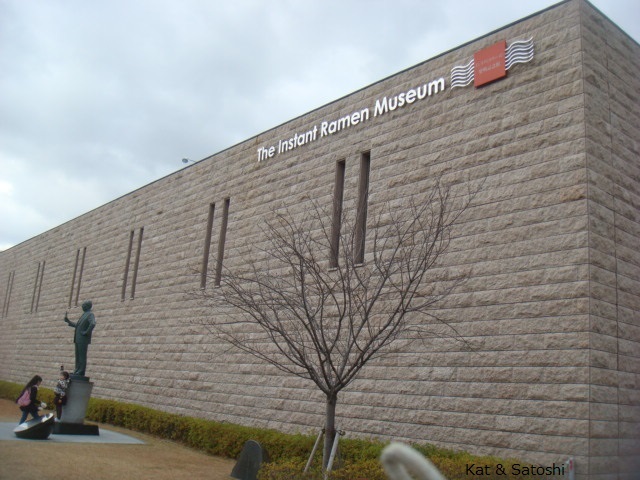 The museum is dedicated to Momofuku Ando, the inventor of instant ramen. His family home is located right across the museum. 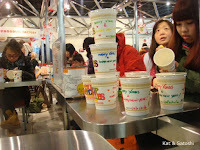 Most of their exhibits are in Japanese, so it may be hard to understand, but you can see how instant ramen has grown. 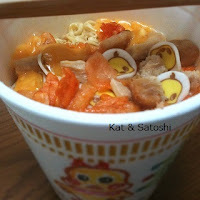 These days, Nissin not only makes instant ramen but instant pasta, udon & soba too. The highlight of this place is definitely making your own cup noodle. 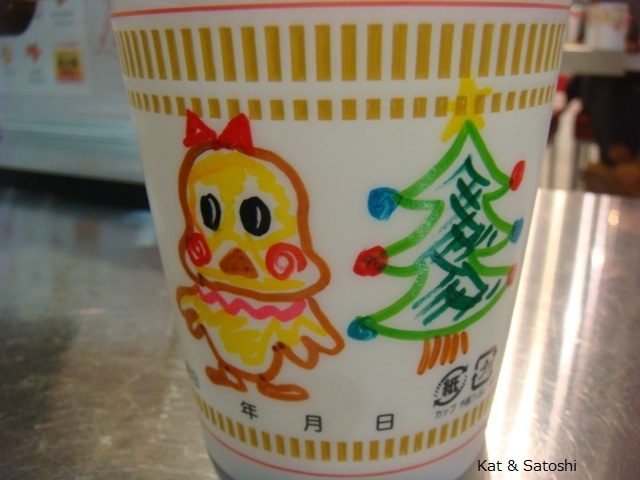 For 300 yen, you get a cup to decorate. Choose your soup flavor and 4 toppings. 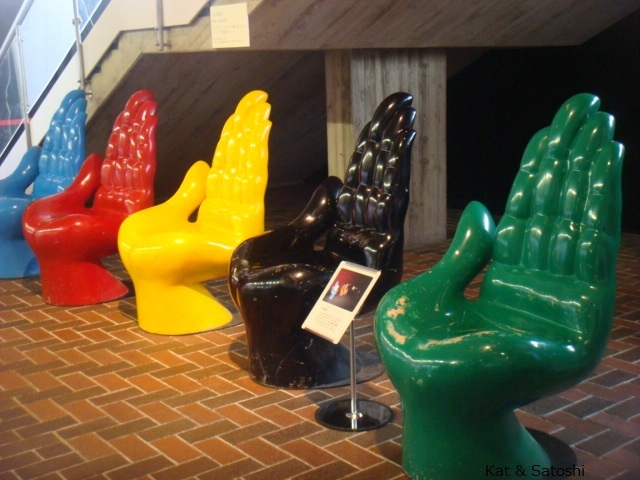 It was cool to see the diversity of visitors to this museum. From pre-schoolers to senior citizens. There were also a lot of foreigners. 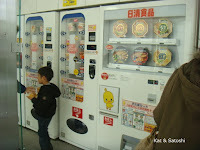 There is also an area where you can taste different instant foods made by Nissin. D's friend insisted that we needed to eat ramen for lunch, so we went to Senri Chuo to his favorite ramen shop, Hokkaiya. 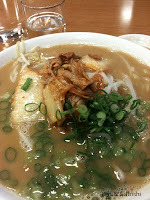 The ramen is a tonkotsu soup with other flavors added. I ordered the shoyu kim chee ramen. The kim chee was actually buta kim chee (pork with kim chee). 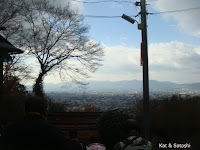 Then D's friend took us to the Banpaku Koen, the site of the World Expo in 1970. 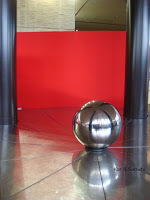 The theme of this expo was the future so there were many futuristic displays and pavillions back then. One pavillion is still around and this is where they exhibited some memorabilia from the expo. The size of the park is 264 hectares (652 acres)...huge! 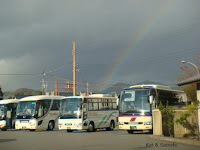 There is a small admission into the park, 250 yen. And an admission to see the memorabilia...400 yen. But it is a great place to hang with nature. 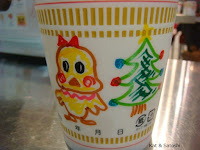 I ate my cup noodle the other day for lunch...so good! 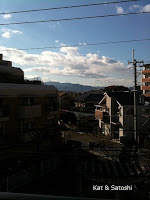 D is off to other parts of Japan before he returns to Hawaii, I hope he enjoyed his time in Osaka. 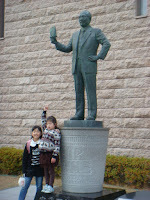 We enjoyed spending time with him and his friends. Our family friend, D is visiting from Hawaii, so this past Sunday, I tagged along and played tourist with him and his friends. 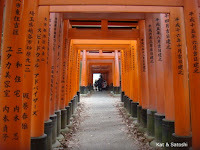 Our first stop was Fushimi Inari in Kyoto. It had been ages since I had been there that I really didn't remember visiting it. 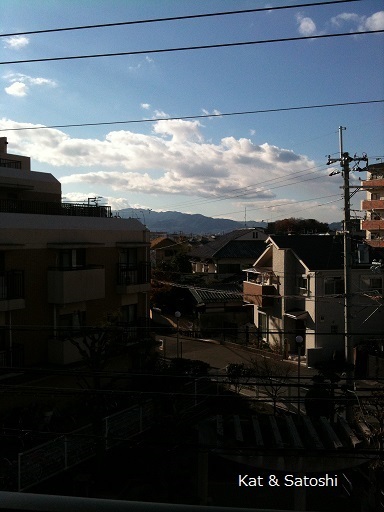 Before exploring the shrine, we stopped into Oumi-ya for lunch. 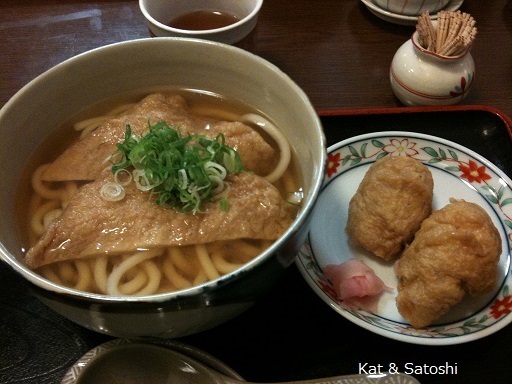 If you are near an Inari shrine what better food to have than inarizushi, right?! 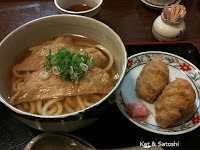 We had the kitsune udon and inarizushi set...the day was overcast and kinda icy, so this was perfect. After lunch we explored the shrine. 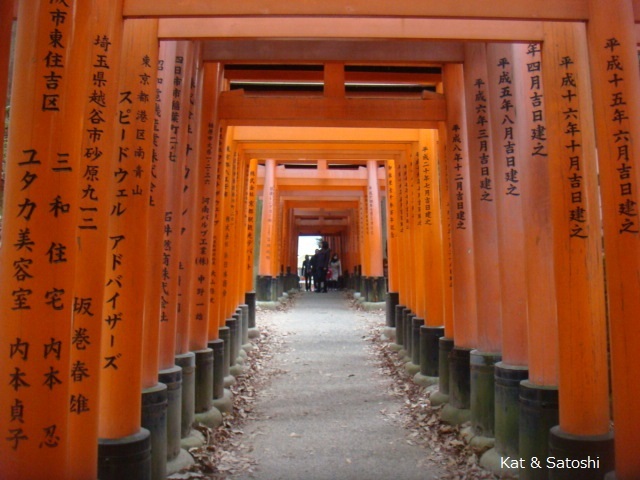 Tons of torii (gateways). These are all donated by businesses as well as families. The size of the torii depends on the donation. To get to the top of the mountain, you need to climb a LOT of stairs. There was a hiking club that was there and boy were those seniors speedy! 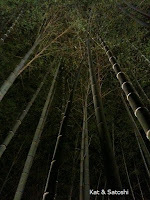 And then we headed to Arashiyama. 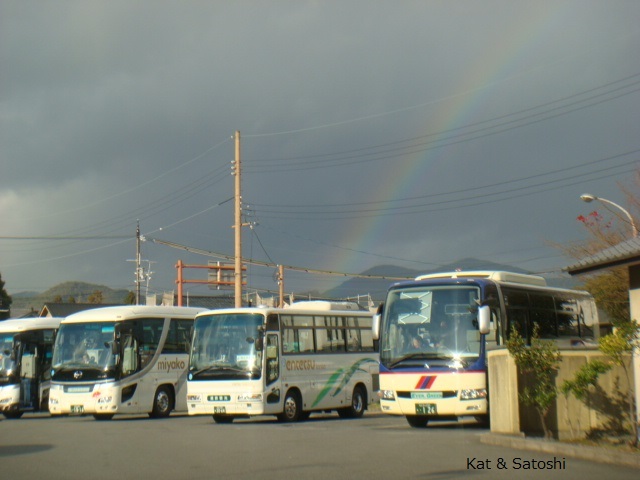 What a treat it was to see a rainbow! definitely a rarity in Osaka. 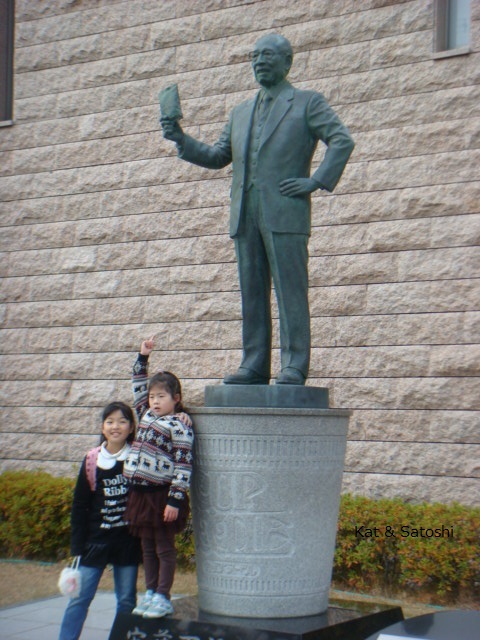 Since it was Sunday, we met Satoshi after his German class. 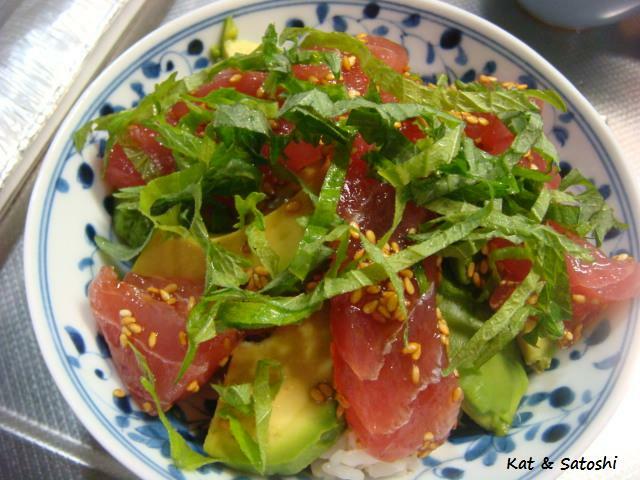 Everyone was feeling a bit peckish, so we popped into Koro-kaki for a little something. 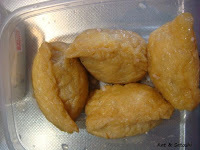 I had the black bean warabi mochi. This cafe is located in a very old Japanese house. So old that their bathroom is located outside...ahem! In fact, Satoshi explained that old Japanese houses didn't have hallways, so to get from one room to another you had to go out of the house to the room you wanted to get to...whoa?! 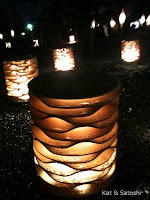 Then after the sun set, we walked to an area that was participating in a light up called "Hanatouro". Satoshi and I had checked this out in 2006 but my photos didn't come out too nice then. 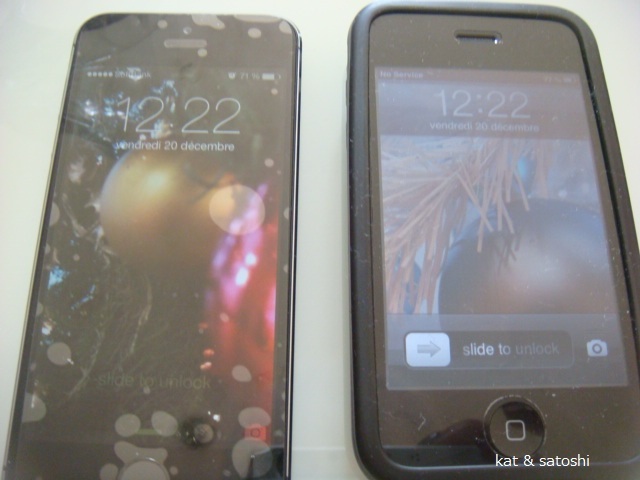 I remember it being darker, not as lit up, I must say it has gotten better! Despite the icy winds and rain, it was a nice way to spend a Sunday with friends. 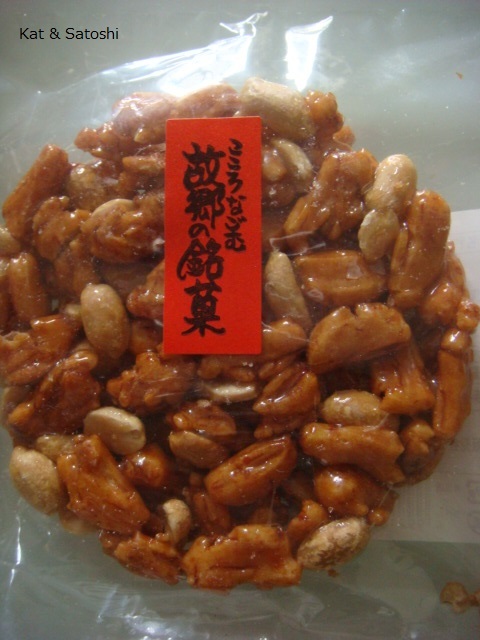 I found this arare, peanut combination called Kokyo Daiko (literally hometown drum) by AokiKoetsudo, a snack maker in Kyoto, at Crazy Pantry recently. 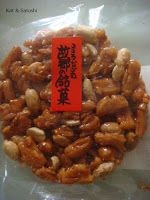 The arare (rice cracker) is shoyu salty with some chili and the peanuts are roasted. Everything held together with a "caramel"...it is kind of like a brittle if you will, but salty-sweet. 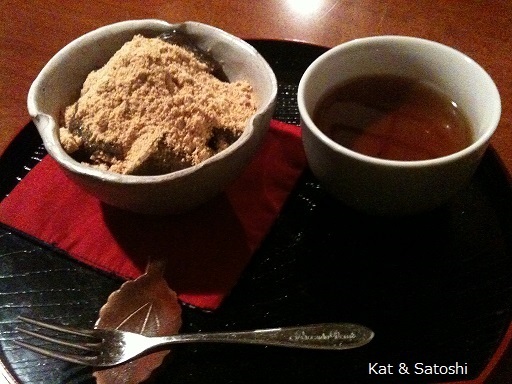 So good, especially with green tea. I think I've told you that in Japanese, "mottainai" means "wasteful" or "what a waste". Well, over the past month I've watch them clear this patch of land in our neighborhood. This patch of land had 4 homes on it, which they have knocked down 3 of them already. All belonging to the same family. It had these 3 sequoias as well as fruit trees and two large cherry trees. 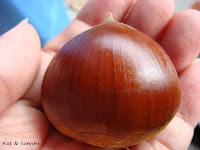 It was the house where I found this chestnut as I was walking past. 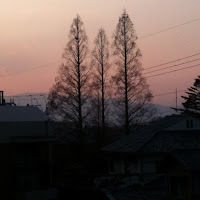 And the house where I would almost always take a photo of the sunset and give thanks. 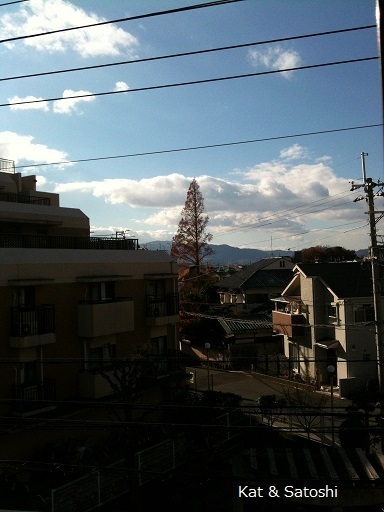 Satoshi loved the sequoias, he said he could feel the different seasons by watching them change. 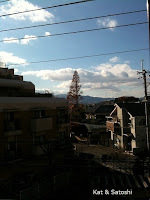 When they sent us the notice that they would be clearing the land, Satoshi insisted that wouldn't cut down those trees. But the other morning, they did. I had heard a thump and looked out the window. And then I heard another thump and they were gone. I think it is so wasteful whenever they build or re-build in Japan, they totally clear the land of all buildings, plants and trees and start from "scratch". For a country who talks about recycling and saving the environment, I think this is quite ironic and sad. 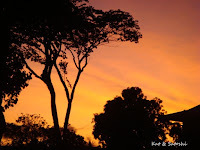 Still, I want to thank those trees and plants for making our days happy ones...thank you! just a little more fall foliage..